We travelled to Modeligo to play Naomh Brid last Sunday in the second round of the under 14 football championship. This got off to a slow start but our lads settled down after the first 10 mins to play some good football. Our boys finished strongly and won their second game in this championship. We would like to wish Gearoid Hallinan and Ben Flynn speedy recoveries both picked up knocks during the game. Panel: Aarron Beresford, Tommy Walsh, Shane Ahearne, Cian Fagan, Padraig Moore, Bearach Moore, Gearoid Hallinan, Tom Looby, Sean Crotty, Sean Whelan-Barrett, Shane Kiely, Ben Flynn, James Riordan, Jack Kiely, David Montgomery, Dean Beresford Jamie Walsh. Our second teams game was postponed. Next week we play Dungarvan in Abbeyside at 10:30 Sunday morning. Training continues on Tuesday evenings at 7pm. Indoor hurling continues this Friday night in the Friary gym starting at 6 pm for five and six year olds. Please note that helmets will be on sale at the indoor hurling this Friday night in the Friary. We would like to send out our heartiest congratulations to the local Colaiste Dungarbhain side that retained the Harty Cup in Tipperary town on Sunday afternoon last. This is a wonderful achievement for all concerned. Special mention must go to our own club players involved who were namely Sean Daly, Eamonn Crotty, Laurance Power, Conor Prunty and Brian Looby. This is a great start for these young players in their careers and one they will treasure for many years to come. Once again we urge all juveniles to pay their membership as soon as possible. Some championships have started and some are starting in the next few weeks and for insurance reasons it is vital that this is paid as soon as possible. Training is scheduled for this Friday evening at the club pitch at 7 pm. 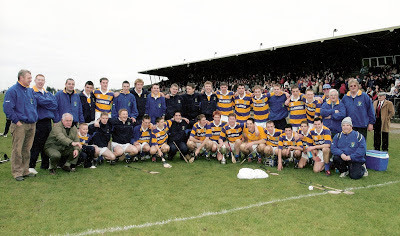 Back Row (L to R): Pakie Hurney, Tomás Kiely, Neil Moore, Eddie Casey, Patrick Lynch, Daryl Ryan, Simon Hanrahan, Liam Briggs, Seán Kiely, Michael Browne, Seán Byrne, Patrick Hurney, Peter Phelan, Rick Hanrahan, Jason O'Brien, Mark Gorman, Eoin Enright, Jimmy O'Leary, Bernard Shields, Greg Fives. Front Row (L to R): Tony Mansfield, Philip Cashin, Aonghus Murray, Thomas Cashin, Mark Ferncombe, Tiernan Murray, Séamus Shields, Mark Fives, Declan Fives, John Hurney, Pa Enright, Richie Foley, Brian Scanlon, Joey Mullen, John Kindregan, Michael Scanlon. This week's photo shows jubilant Abbeyside players, mentors and supporters following a seven point victory over Ballygunner in the replay of the 2004 U21 'A' County Hurling Final. The original fixture ended all-square at 1-14 a piece in one of the best hurling games in Waterford that year. The win secured only the club's second title at this grade and the first since 1966. Our popular Jack the Joker Fundraiser will continue this Sunday night in Kennedy’s Live where the Jackpot will be €8,332 as on Sunday night Mike Briggs was drawn out of the drum but did not find the Joker, however he did win €50, while Fr. Cooney and Matty Kiely won €25. We appeal to all our supporters to continue purchasing the tickets as the funds raised will go towards our ongoing development works at the club grounds. On Sunday last we travelled to Ardmore to take on Dungarvan in the first round of the Western Championship and at the end of a well contested game we emerged victorious and now advance to the Western Semi Final where our opponents are Comeragh Gaels. This game will take place in Fraher Field on Saturday March 2nd. TEAM: P. CASHIN, S. O’GORMAN, B. LOOBY, S. O’CONNOR, E. BERGIN, D. COLLINS, A. KEANE, R. DUNFORD, R. SHEEHAN, B. HENLEY, E. COLLINS, M. MAHER, R. PROCTOR, C. KINDREGAN, M. RAHER. SUBS: D. SWEENEY, T. AIRD, E. CROTTY, P. COLLINS, M. FLYNN. Our Bingo continues this Sunday night when we will return to our normal venue of the CBS Hall where the jackpot is €1,050. On behalf of all in the club we would like to congratulate Gary Hurney on being selected on the Munster Football team on Sunday last who were narrowly defeated by Ulster in Armagh. On Thursday February 21st the County Board are holding a table quiz throughout the County with the questions being aired on WLR FM buy our own Bob O’Brien and Kieran O’Connor. There was a fantastic turnout of club personal last month for the footballers quiz so it would be great to see a big turnout in Minnies Bar at 8:30 pm on the night to support our County. Teams of three or four cost €10 a person. The next meeting of the club committee will take place tonight, Wednesday February 20th at 7:30 pm in the club grounds. On behalf of all in the club we would like to send our sympathies to Mrs. Margaret Looby on the death of her father Michael McGrath last week. The Looby family has given wonderful service to our club for many years and continue to do so today. Indeed Michael’s grandson Brian showed great club spirit in lining out for the Club on Sunday so soon after the death of his grandfather. Once again we send our sympathies to Margaret and all the family and friends of Michael McGrath. We would also like to send our sympathies to the family and many friends of the late John A Murphy, Dungarvan who passed away last week. John A was a true legend of the GAA and had many friends in Abbeyside particularly in Alice O’Connor’s Bar where he enjoyed many a great nights entertainment with his friends many of whom would be visiting him from the four corners of Ireland and from overseas. Ar dheis lamh De go raibh a hanam usail. Last Sunday was our first outing in the Under 14 Football championship at home to the Brickies. Our boys played some good football despite the very windy conditions, to win the game. Panel: Aaron Beresford, Tommy Walsh, Shane Ahearne, Cian Fagan, Padraig Moore, Bearach Moore, Gearoid Hallinan, Tom Looby, Sean Crotty, Sean Whelan-Barrett, Shane Kiely, Ben Flynn, James Riordan, Jack Kiely, David Montgomery, Dean Beresford. Next Sunday morning both our under 14 teams are in action away to Ballyduff Upper and Naomh Brid. The under 14 football will continue for the next 5 weeks on Sunday mornings. Training continues on Tuesday evenings at 7pm. Congratulations to the Friary College on winning an Craobh Corn an Runai in Mallow on Wednesday last. The final score on the day was 2-13 to 1-5. On the starting 15 the club was represented by Brian Looby (capt), Kevin Dwane, Conor Prunty and Michael Maher, and on the panel by Eamon Crotty, Eoin Kiely and Kevin Dee. We would also like to send our best wishes out to Colaiste Dungarbhain who take part in the Harty Cup Final this weekend. We are represented here by Brian Looby, Laurence Power, Eamonn Crotty, Sean Daly and Connor Prunty. Again we urge anyone who has membership forms to return to do so as soon as possible. Training continues this Friday night in the friary college gym beginning at 6 o clock for five and six year olds. Again we like to remind parents that there is a one way traffic system operating in the grounds of the Friary and we ask all parents to adhere to this. Due to the Harty Cup Final this weekend our fixture against Dungarvan fixed for Sunday morning has been postponed. The refixture of this tie will be announced shortly. Under 16 hurling training continues this Sunday morning coming. Players will be notified times by the teamer. Back Row (L to R): M. Hates, D. Hogan, C. Clancy, L. Shanley, J. Mulligan (Capt. ), M. Collins, D. Clarke, W. Kiely, N. Hannigan, G. O'Connor. 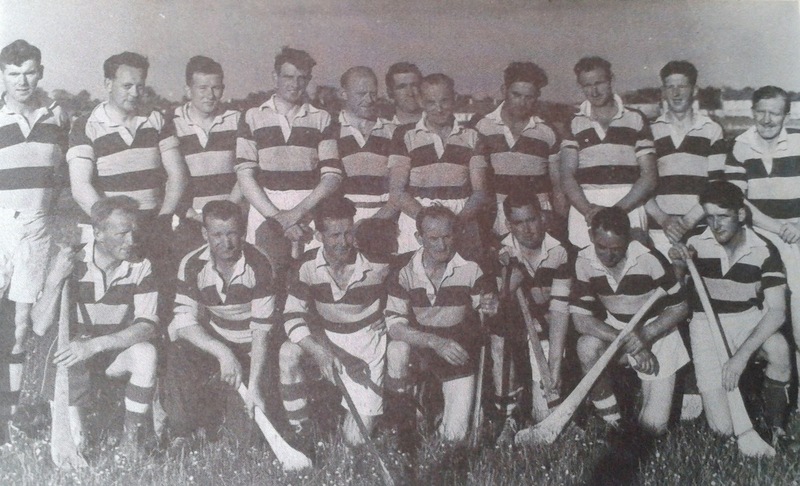 Front Row (L to R): Martin Foley, M. Organ, D. Coleman, Maurice Foley, J. Curran, J. Healy, D. Looby, J. Kiely, R. Moloney. 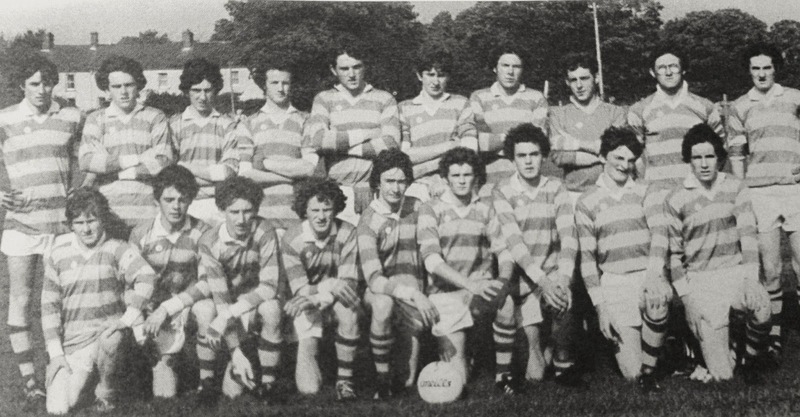 This week's photo features the Abbeyside Minor Football panel that won the Western Title in 1979. Early round victories over Lismore, Dungarvan, St. Oliver's and Affane meant a Western Final meeting with Kilrossanty at Fraher Field in August. A three point, 1-6 to 1-3 victory secured a tenth divisional title at this grade. Unfortunately, the lads were defeated six weeks later in the county decider by De La Salle. Our popular Jack the Joker Fundraiser will continue this Sunday night in Kennedy’s Live where the Jackpot will be €8,050 as on Sunday night Lee O’Donnell was drawn out of the drum but did not find the Joker, however he did win €50, while Sean Kiely and Eoghan Cosgrave won €25. We appeal to all our supporters to continue purchasing the tickets as the funds raised will go towards our ongoing development works at the club grounds. This Sunday we take on Dungarvan in the first round of the Western Championship in Colligan at 2:30 pm where all support would be greatly appreciated. Our Bingo continues this Sunday night when we will return to our normal venue of the CBS Hall where the jackpot is €1,000. On Saturday night last Waterford Senior Footballers continued their good start to the National League with a victory over Tipperary in Fraher Field. Representing our club on the team were Stephen Enright, Shane Briggs, John and Patrick Hurney and Sean O’Hare. On Thursday February 21st the County Board are holding a table quiz throughout the County with the questions being aired on WLR FM by our own Bob O’Brien and Kieran O’Connor. There was a fantastic turnout of club personnel last month for the footballers quiz so it would be great to see a big turnout in Minnies Bar at 8:30pm on the night to support our County. Teams of three or four cost €10 a person. A five a side soccer tournament will be held in the Friary hall on Sunday the 17th of February in aid of the Harty Cup training fund. €10 per person charge will apply. Contact Darragh Duggan on 0862662403 if you would like to enter a team by Thursday. All support will be greatly appreciated. Minor footballers travelled to the Mill field in Ballymacabery on Sunday morning last the 9th to play the Nire in their opening round of the county championship. Great football was played by all and thankfully we got our campaign off to a winning start. Indoor hurling continues every Friday night beginning at six o clock for five and six year olds. Please note a one way system is in operation in the Friary grounds. The joker fundraiser will be on sale every Friday during indoor hurling. We appeal to parents to support this as it goes to development of club grounds. This development will ensure safe and top class training facilities for our children into the future. Membership is now been taken up. Players are reminded that as the championships are starting soon. This needs to be paid as soon as possible. Our under 14 championship gets off to a start this weekend. Our first game is against the Brickey Rangers at 10:30 on Sunday morning. Support would be appreciated here. Well done to our Under 8 panel who over the last two weekends took part in the Waterford Coaching and games which were held in Ballinameela and Kilgobnet. Our panel was divided into two groups, one going to Ballinameela and the other to Kilgobnet for the indoor hurling in week one, and then the same venues for the football the following week. A special thanks to the parents for travelling with the boys to get them there and for making sure they all had the mouth guards which is mandatory for football. Training this Friday night, 15th March, in the Friary hall at 6.45, watch out for the teamer and please reply. 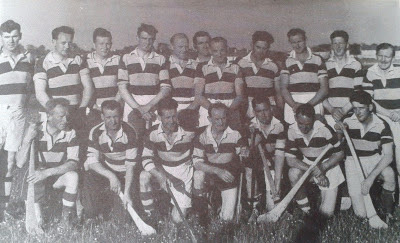 Back Row (L to R): P. Foley, J. Winters, S. Keating, R. Russell, G. Hogan, T. Kiely, P. Nagle, M. Fives, J. McGregor, V. O'Brien, T. McCarthy. Front Row (L to R): S. O'Brien, M. McGovern, N. McGovern, P. Brett, D. O'Connor, P. Whelan, D. McGovern. 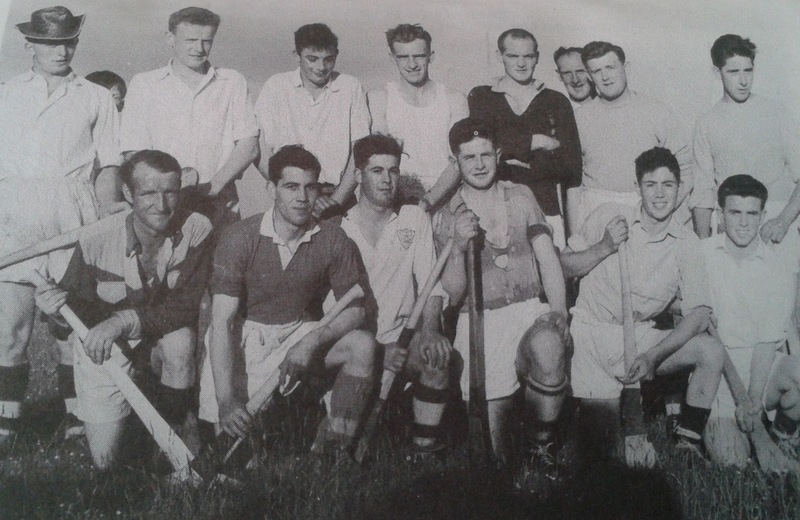 This week's photo features a Married selection who took on an Unmarried XV in a novel challenge in July 1958 at Dungarvan's Fraher Field. In a match refereed by Austin Flynn, the Married Men beat the Bachelors on a scoreline of 8-3 to 1-5. A large attendance produced gate receipts of £7.95.